91 Vinous Media (fermented in stainless steel tanks; malo in 500 liter French oak barrels and eight months of aging in used barriques, 80% French and 20% American) Brilliant violet color. Pungent, spice-tinged cherry and redcurrant scents are complemented by mineral and woodsmoke notes and a hint of mocha. Sappy and energetic on the palate, offering juicy red fruit preserves, spicecake and violet pastille flavors that convey an appealing blend of richness and delicacy. Finishes taut, smoky and quite long, leaving suggestions of candied flowers and cola behind. 89 Wine Spectator This expressive red offers fruitcake flavors, with candied cherry, orange peel, vanilla and nutmeg notes mingling over citrusy acidity and light tannins. Drink now through 2028. 1,670 cases made. 88 View from the Cellar The Rioja “Solarce” from Bodegas Casa La Rad is produced from an interesting blend of sixty percent Tempranillo, thirty percent Garnacha and five percent each of Maturana and Cabernet Sauvignon. The wine is fermented in stainless steel and raised in new French barrels for eight months prior to bottling. 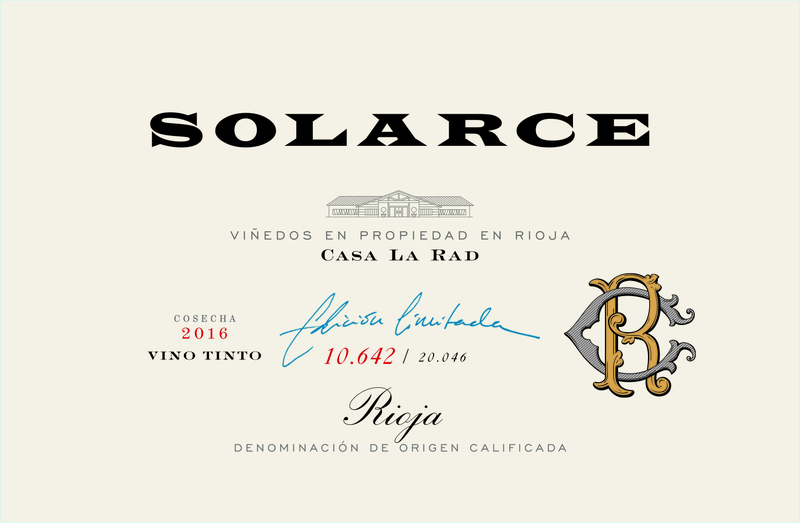 The 2016 Solarce offers up a fine nose of raspberries, cherries, lovely Rioja spice tones, a fine base of soil, a touch of coconut and a fairly generous framing of cedary French oak. On the palate the wine is pure, full-bodied and focused, with classic Rioja velvetiness on the attack, a good core, but a bit of uncovered oak tannin stiffening up the long and complex finish. I really love the wine here, but I am not in love with the oak treatment, which is not as deftly done as the winemaking itself. The oak tannins stick out a bit on the finish, which takes away a couple of points from the score, but the raw materials here are first rate and the potential here is outstanding. This is only eighteen dollars retail in the US, which makes it a pretty good value, but without buying new oak and seasoning up the barrels in the cellar with a few more vintages, this could become one of the greatest bargains in all of Rioja, as the underlying wine is that good! My score reflects that the wine is slightly over-oaked, but it is still a good drink in this condition, and if the Bodegas can start using older casks for the elevage, this is going to be a name to watch in Rioja! 2018-2030+.